This weekend was jam-packed with warm weather activities. It felt like summer- I even got my first sunburn of the year. 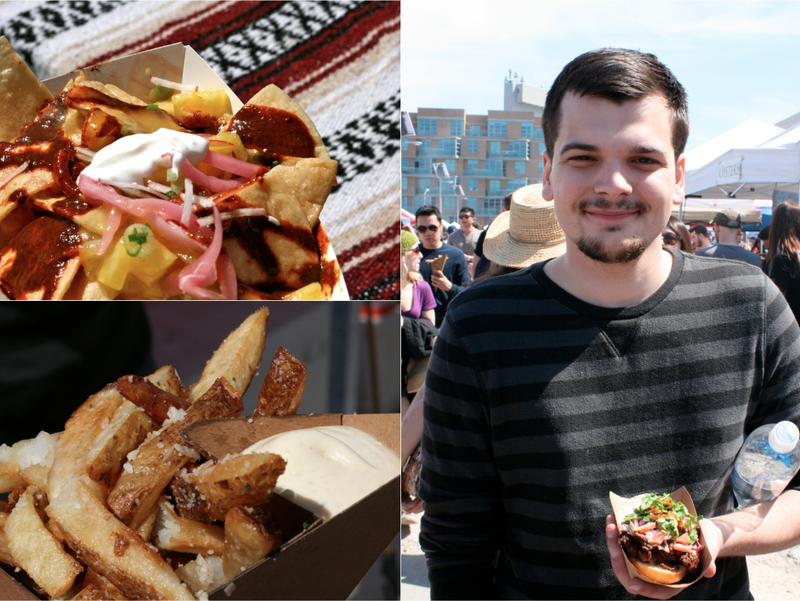 Preston, my friend, Vanessa, and I decided to go to Smorgasburg in Williamsburg. It's a ginormous food market. We wanted to try a bit of everything, which is impossible, but we did manage to hit up quite a few different vendors. Everyone else in New York City seemed to have the same idea as us. The space was filled with people celebrating the onset of spring and the second opening weekend. It was definitely difficult to make a decision as to where to eat. We started off with kebobs from Monk's Meat-which is actually not meat at all. These were so good! Even my non-veggie compadres enjoyed these seitan skewers. Vanessa & I picked up some nachos from El Gato Nacho. Yes, I fell for the cute cat name and chalkboard pictures. The nachos were quite refreshing for the hot day. While we were in line, Preston picked up Korean BBQ. His little slider looked delicious. Most of the lines we waited in weren't too long, but we did brave a lengthy wait for french fries at Home Frite. We had the Truffle fries and the Boardwalk fries. Yum. Though for the most part we wanted to try new places that we haven't yet tasted, we made an exception for the classic Milk Truck. We needed milkshakes. After we decided we couldn't eat anymore, though we wanted to...we enjoyed a long (like really long) walk through Williamsburg. The views of the city were awesome. We love our food trucks, well make that food tents, and will definitely be headed back soon. Smorgasburg is every Saturday at the Williamsburg location and Sundays at Brooklyn Bridge Park (which is actually where our long walk took us). Other Brooklyn Flea locations we like to visit are at Fort Green Flea and Park Slope. Those markets have food as well as your usual flea market knick knacks. We were just at the Park Slope flea last weekend.